With this week's unveiling of the new Xbox One gaming system, Microsoft says it will beef up its Xbox Live platform with 300,000 servers, a huge jump from the 15,000 servers currently supporting the platform. With this week's unveiling of the new Xbox One gaming system, Microsoft is more talkative than usual about the infrastructure supporting its Xbox platform. The reason? Microsoft says the new console will be able to tap cloud resources to enhance the game experience. What will that mean for the infrastructure supporting the Xbox platform? "When we launched Xbox Live in 2002, it was powered by 500 servers," Microsoft's Marc Whitten said in introducing the new platform. "With the advent of the 360, that had grown to over 3,000. 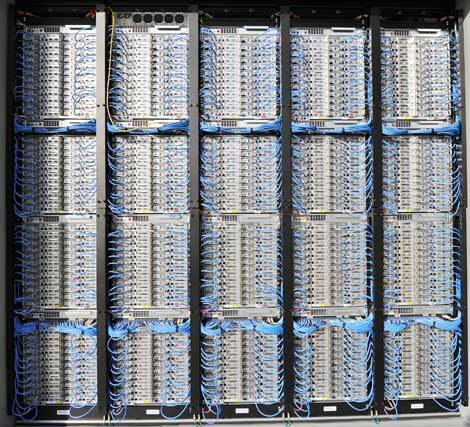 Today, 15,000 servers power the modern Xbox Live experience. But this year, we will have more than 300,000 servers for Xbox One." Those servers will expand the Xbox network's storage capacity to enable users to store their saved games and entertainment in the cloud. But how will these cloud servers work with the console to deliver the Xbox one gaming experience? General Manager of Redmond Game Studios and Platforms Matt Booty provides some answers in a discussion with Ars Technica. At the heart of the issue is "lag" or latency, the delay seen in online connections as data moves between the server and the hardware in your home. Booty says cloud assets will be used on "latency-insensitive computation" within games. "There are some things in a video game world that don't necessarily need to be updated every frame or don't change that much in reaction to what's going on," said Booty. "One example of that might be lighting," he continued. "Let’s say you’re looking at a forest scene and you need to calculate the light coming through the trees, or you’re going through a battlefield and have very dense volumetric fog that’s hugging the terrain. Those things often involve some complicated up-front calculations when you enter that world, but they don’t necessarily have to be updated every frame. Those are perfect candidates for the console to offload that to the cloud—the cloud can do the heavy lifting, because you’ve got the ability to throw multiple devices at the problem in the cloud." This has implications for how games for the new platform are designed. So how does Microsoft scale from 15,000 to 300,000 servers? More data centers. This year we've recently profiled major expansions at three of Microsoft's data center hubs in Virginia, Ireland and Washington state. Check out these stories for a closer look at the "cloud end" of Microsoft's online experience.